Phonemic awareness, phonics, vocabulary, fluency and comprehension -- the five key components in teaching reading* -- provide a great foundation, but how do we move students from learning those skills to becoming engaged, thinking readers? We immerse them in the experience by reading aloud. According to international literacy expert, former teacher, and best selling author Mem Fox, "If every parent and every adult caring for a child read aloud a minimum of three stories a day to the children in their lives, we could probably wipe out illiteracy within one generation." Read aloud for at least 15-20 minutes a day, at the same time(s) each day. Choose mornings/homeroom, after lunch, or just before dismissal. If you can't commit 15 minutes at a time, try three five-minute blasts. 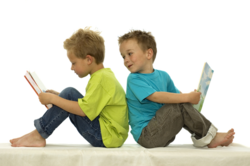 Present the read aloud as an enjoyable experience, not as a "learning opportunity." A goal with read alouds is to show students the application of what they're learning -- an end result they can relate to, that's fun! No one remembers favorite worksheets; we remember favorite books. Students need to see reading as a way to find information, a way to learn how to do something new, or just as an activity to enjoy. Your challenge is to change how students view reading by sharing the most delicious stories and information you can find for your mix of students. (Try Who is It?, by Sally Grindley, or the front page of your local newspaper). Choose materials of interest to your students and think outside the box. Read up to two grade levels above your student's reading level. (Listening vocabulary is higher.) Bring two or three books and let students choose which to hear first; stories like The Boy Who Saved Baseball, by John H. Ritter or Charlotte's Web, by E.B. White, for example. Connect books to content learning -- but don't tell students you're doing it! For example, The Scarecrow's Hat, by Ken Brown, is a great example of sequencing as well as an introduction to animals. If students are learning about the eye in science or people with disabilities in health, share the lives of Helen Keller and Ray Charles, two people who moved beyond their blindness to contribute mightily to our world. Do you have a favorite read-aloud book or technique to recommend? Click here to go to the Education World Language Arts message board and share your thoughts. Introduce new vocabulary in at least one daily read-aloud session. Choose one word from the text, and only take a minute or two. Begin by saying: "Today, students, we are going to play a game." (That always gets their attention!) "When I write the word of the day on the chalkboard, if you know the meaning of the word, put one hand over your mouth and raise the other hand." (That technique prevents students from blurting out the answer, allows the teacher to select who will participate, and interjects an extra element of fun). Watch a few hands go up. Through this exercise, you have modeled meaningful comprehension strategies and shown students the context in which to use those strategies. Remember to reinforce the lesson by pointing out the word of the day when you next encounter it in the text. Sparingly allow student to do the same, but keep the story moving -- especially if you are working with a limited amount of time. Close the read-aloud session at a cliffhanger moment. Use such natural breaks as pages or chapters, but always stop at a suspenseful moment or at a moment of uncertainty. Leave them begging for more! For information about getting parents involved in the read-aloud experience at home, check out trelease-on-reading.com, a Web site from read-aloud guru Jim Trelease, or Reading is Fundamental. * The National Reading Panel: Reports of the Subgroups, (2000). Teaching Children To Read: An evidenced-based assessment of the scientific research literature on reading and its implications for reading instruction. Washington, D.C. Known as the "Literacy Ambassador," Cathy Puett Miller has a library science degree from Florida State University. Her writing appears in such print publications as Atlanta Our Kids, Omaha Family, and Georgia Journal of Reading, and online at Literacy Connections,Parenthood.com,Education World,Family Network, and BabyZone. Click to read a complete bio.